ONE WINTER DAY IN 1902 a tall, blue-eyed, earnest-looking man in his late thirties stepped off the train at the small Swedish border town of Charlottenberg. He was Ivar Enger, a Norwegian. With his two brothers, he operated a small factory making target bullets in Oslo, Norway. In a few years, his bullets had become famous at every Norwegian rifle range. 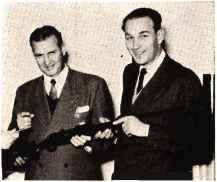 Now, the shooting fraternity of Sweden, which had been importing German bullets at high prices, asked the Enger brothers to open a factory in Sweden. been taken by a tobacco factory. Back to the train Enger went, and travelled one stop farther into Sweden to Amotfors. This is how it happened that the now world-famous Swedish Norma Ammunition Factory came to be built in the little village of Amotfors. Today, Norma ammunition is known the world over. Firsts in recent years for the Norma line included the first commercially loaded sporting ammunition in a variety of military calibers, such as the 6.5 and 7.7 Japanese loads. First also was Norma with reloadable cases, designed by the factory for its regular ammunition but identified on the base with stamp "Re" indicating it was strong for reloading. Reloading is a good word at Norma. The company has built a big business upon a basis of reloading eenterfire ammunition for the Swedish rifle clubs. Norma was first also with offering unprimed empty cartridge cases to U.S. gun cranks so they could be shipped by mail: with primers in them, empty cases for handloading must be shipped expensively by express. And another first was the Norma straight-drawn case, suitable for any load according to how the handloader necked down the straight-walled semifinished shell. Studying diverse shooting interests gave Norma through the years a commanding position. Their rise from a rented wooden frame farmhouse to a modern ammunition factory is a story of mass-producing shooting quality. 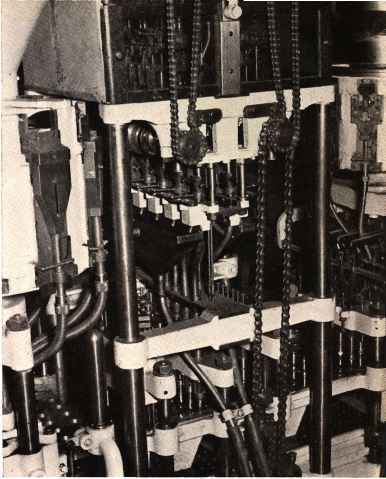 Fully-automatic bullet making and case sizing machines at Norma (above) chomp out loaded ammo and components which must be mass-tested to save time. 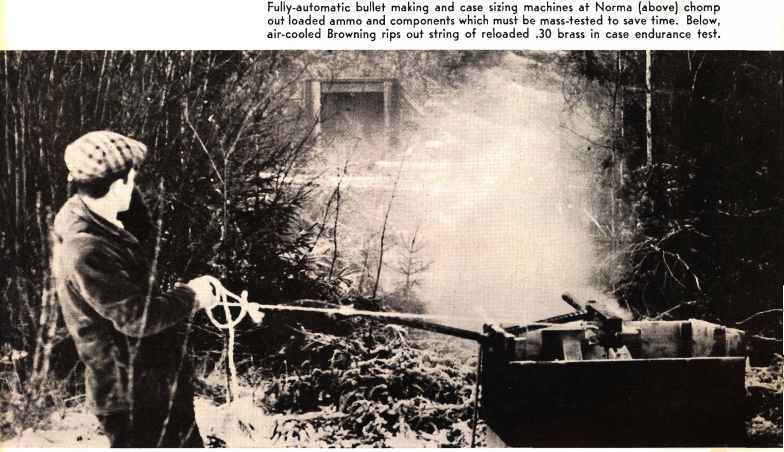 Below, air-cooled Browning rips out string of reloaded .30 brass in case endurance test. Under microscope, case brass crystals show regular form indicating strong metal structure in Norma neck anneal. Bad brass shows weakness through crack-like lines extending across the individual grains, reducing strength. 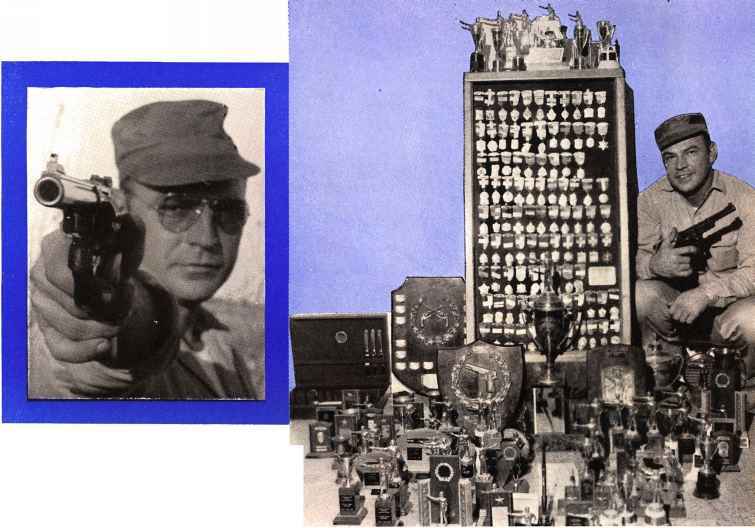 about 45 million rounds of match rifle ammunition a year, but even fifty years ago they consumed a vast amount of it. Many shooters handloaded Norma bullets, and the cartridge was the same then as now, the 6.5 x 55 Mauser cartridge, adopted by the Swedish Army in the Model 1894 Mauser Carbine and 1896 rifle, and the Norwegian forces in a Krag-system rifle. Then came the Great War. The Scandinavian countries remained neutral but stepped up military training. The Rifle Associations accepted new members who wanted to improve their rifle shooting ability, in case of an emergency. An ammunition shortage loomed ahead, and Norma found itself having to change from just a bullet factory to a complete ammunition loading plant. The machines look similar, and some of the production methods are related, but there is a big step from making just bullets, to producing complete loaded cartridges. New buildings, equipment, technicians and, most costly of all, new experience had to be added. By 1918 the Norma factory capacity could take care of the Rifle Association needs, with production to spare. The extra capacity was turned to producing hunting ammunition, and so growth continued. Domestic demands remained fairly constant and, outside of Scandinavia, the name Norma was little known. When the dark clouds of war again gathered over Europe in 1939, there was a renewed demand for the old 6.5 military cartridge, far greater than it had been a quarter of a century before. The case was the same, but the cartridge was much improved. The bullet was no longer the round-nosed Model B. A new semi-pointed match-type bullet had been introduced, and then the modern pointed boat tail shape known as "D pointed." The original was a French projectile machined of solid bronze (the "Balle D") : but Norma had perfected drawing and forming their bullet with a lead core and tough steel jacket in the "triple plate" design, a rolled lamination of steel sandwiched between gilding metal. The steel gave penetration in jacketed form, with controlled expansion in the hunting loads. The gilding metal protected the bore from steel-on-steel wear. Norma sporting ammo since the 1920s, and Norma military ammo since 1941, has used non-corrosive primers. Roy Weatherby consults with Amund Enger at Norma works about new .460. Norma is major custom ammo maker. Top photo shows five of Weatherby Magnum lineup, then 7&6I Sharpe & Hart, and Jap 7.7 and 6.5 dimensioned from sample rifle chambers. Cases are punched in stages from cupped blanks of brass.